How to find love in a bookshop is a wonderful novel. It is the first of Veronica Henry's that I've read, but it certainly won't be my last. Julius Nightingale is newly widowed when he buys a bookshop in the small but lovely Cotswold town of Peasebrook. Some Thirty odd years later and Emilia Nightingale finds herself the owner of Nightingale Books after the tragic and untimely death of her Father. She has promised to keep the bookshop alive in his death, yet had no idea of the financial difficulty that the shop was in. When a local property developer approaches Emilia she is quick to tell him to get lost, but then he sends in one of his lackeys to try a different approach, and suddenly Emilia sees a different side to the bookshop than she had previously. Should she really prepare to let it go? Or should she keep it on, if only to honour her Father? Emilia has a difficult decision to face; Nightingale Books is at the heart of the Peasebrook community and its residents won't let it go without a fight. 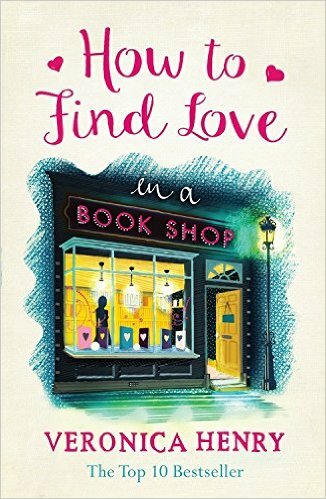 How to find love in a bookshop, is a lovely heartwarming novel that will stay with me for a long time. How to find love in a bookshop is available to buy now via Amazon online and all good bookshops. Thank You to the publishers who sent me an advanced proof of this novel in exchange for an honest review.